Resident Kevin Maijala brings food historian Michael Twitty to Fort Snelling. Maijala and his wife both grew up in the Twin Cities area. They went to graduate school in Virginia, and then came back—they both wanted a small-town atmosphere with a real downtown and White Bear Lake fit the bill. They moved to White Bear in 1999, and Maijala has been working for the Minnesota History Center for 19 years. What do the Maijalas love about White Bear Lake? “The schools (the Maijalas have two kids—one a sophomore in high school and one a senior), Marketfest and the sense of community it represents, and sitting at the lakeside, relaxing with a beverage and having a great time,” Maijala says. Maijala has worked at the MNHS since 2006. He has a master’s degree in museum studies. His goal is to “expand stories to include stories of military, stories of African-Americans, both enslaved and free, stories of Native Americans, especially people of the Dakotas, and the tragic history of Native Americans,” he says. “Every slice of a place’s history has stories to tell, and we want to tell them and make them relevant to today,” says Maijala. Maijala says everyone in Minnesota has a connection to Fort Snelling in some way. 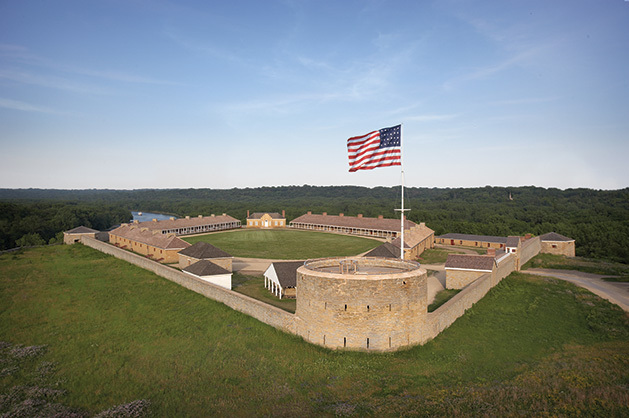 “There were 300,000 soldiers from the Midwest that came through Fort Snelling. In the Civil War, 25,000 came through. And for Native people, the Dakota was an important crossing point. Treaties were signed here, and Native people were interned here when it was a concentration camp before they were pushed out of state. This was after the 1862 war when the Dakota were completely defeated. Women, children and older men were put in the stockade for four to five months, and then sent to Nebraska. About 150 to 300 people died, mostly of epidemics and diseases,” says Maijala. What is now the parking lot of Fort Snelling State Park used to be the area of the stockade, he says. Maijala is also working with the U.S. Department of Veteran Affairs to talk about post-traumatic stress disorder. Maijala was excited to bring Michael Twitty to Fort Snelling. Twitty—chef, writer, culinary historian and educator—won the 2018 James Beard Foundation’s Book of the Year award for The Cooking Gene: A Journey Through African-American Culinary History in the Old South. 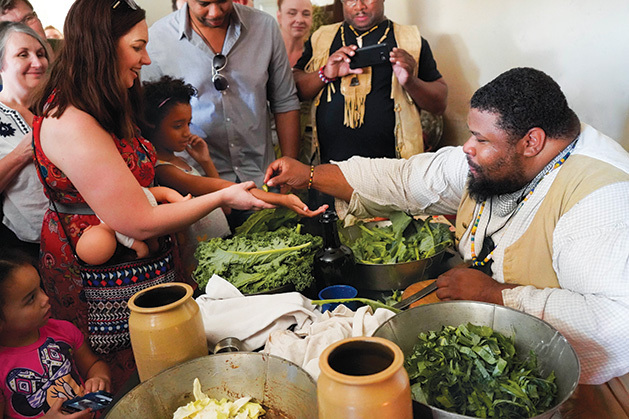 Twitty held food demonstrations in the Fort Snelling kitchen using African American techniques and recipes. Twitty spoke to a full house, saying he is grateful to be able to have a full-time writing career and being able to bring different groups together through food. Twitty is Jewish and African American, which gives him a unique perspective on American cuisine. Twitty discussed how many of us are disconnected from our food. “We don’t grow it—we don’t know where it comes from,” says Twitty. “In Europe, they know where their food comes from.” Twitty hopes to get people thinking about their food’s origins and the stories behind both where food comes and how it’s prepared. Twitty says the narratives people associate with the American south “were here [in Minnesota], too.” The kitchen at Fort Snelling was used by a family almost all of us have read about it history books—Dred Scott and Harriet Robinson Scott lived and worked in Fort Snelling as enslaved people. The Scotts lived at Fort Snelling in the 1830s. During that time, slavery was prohibited in the area, but it existed nonetheless. In the 1840s, the Scotts took legal action to be considered free people on the grounds that they had resided in Illinois, Missouri, Minnesota and Wisconsin, all free states and territories. The Scotts' battle for freedom led to the infamous 1857 Supreme Court decision against the Scotts, which ruled against Scott, and stated that neither the Scotts nor any other person of African ancestry could ever be citizens of the U.S. The decision also declared that the Missouri Compromise of 1820, which restricted slavery in certain territories, was unconstitutional. The reaction to the decision was fierce. 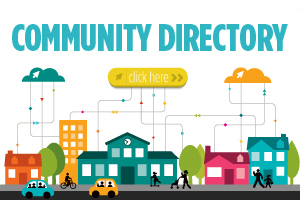 The decision is widely considered to be one of the factors leading up to the Civil War. Food knowledge was largely shaped by slavery, says Twitty. “The lines of where blacks could live were tenuous. They had to move a lot. If you have no property rights, you can’t grow your own food,” Twitty explains. Look out for more programming initiated by Maijala. And now there’s another MNHS connection to White Bear Lake—new director Kent Whitworth, who comes to Minnesota from Kentucky, has chosen White Bear Lake as his home.